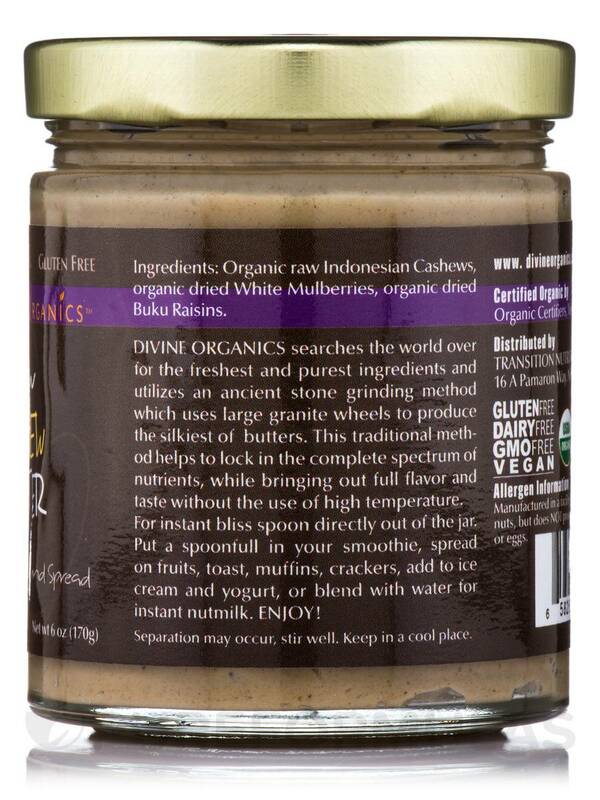 Cashew Butter by Divine Organics has a light, sweet, nutty flavor. Really good for dipping tiny crackers in or pretzels! The texture is very creamy, maybe only slightly 'rougher' than regular peanut butter. While finding cashew butter on store shelves is becoming more common than ever before‚ not every product is alike. The major brands' extensions into other nut butters may contain added sugars or artificial ingredients you want to avoid. 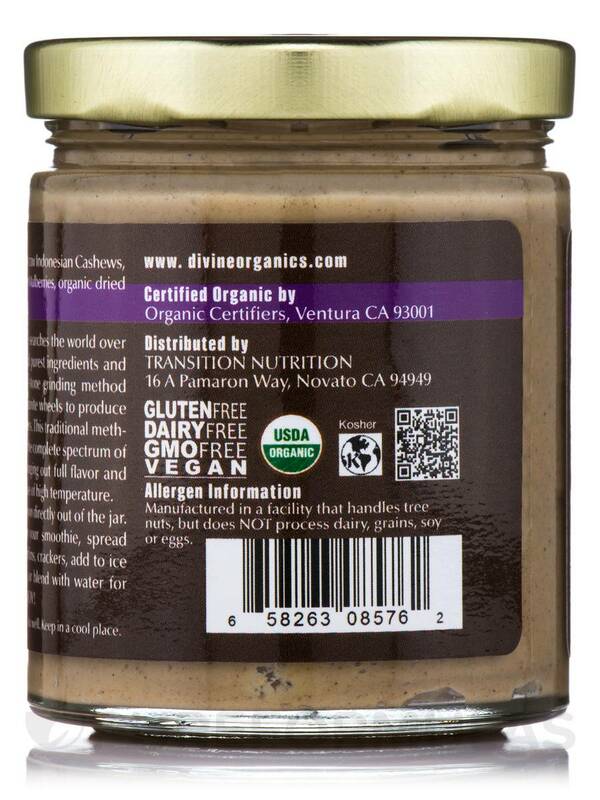 Raw Cashew Butter by Divine Organics is certified organic and made with non-GMO ingredients. 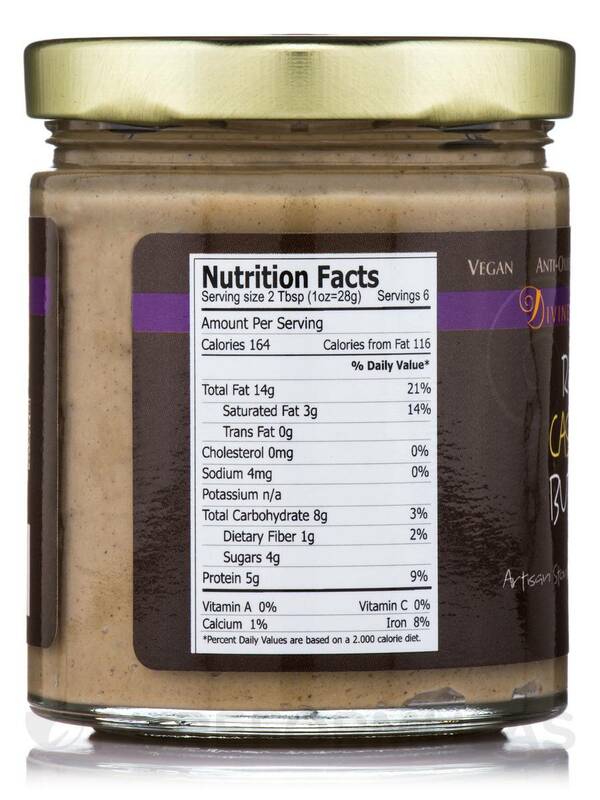 This Artisan Stone Ground nut butter contains only three ingredients. Along with organic raw Indonesian cashews‚ the recipe also contains organic dried Buku raisins and white mulberries to provide a natural hint of sweetness. Buku raisins are sourced from Eastern Europe and have a dark‚ velvety texture‚ whereas white mulberries come from Asia. Being relatively low on the glycemic index‚ Raw Cashew Butter releases its glucose steadily and slowly. This provides a reliable source of energy to perform your daily tasks‚ as opposed to a quick boost and subsequent crash. In addition‚ Raw Cashew Butter is Kosher friendly‚ caffeine-free‚ and gluten-free. It is also great for vegans‚ since it serves as a source of plant protein that provides healthy unsaturated fats‚ B complex vitamins‚ essential amino acids‚ and magnesium. Some experts recommend that you eat raw cashew butter as opposed to the roasted kind‚ since it may have more nutrients intact. Cashew butter can be used in many ways as part of a vegan or low-carb lifestyle. Of course‚ you can spread it over bread and make a sandwich; alternatively‚ you can spread it over apples or other fruits. However‚ it can also be used in cooking curries or baking. 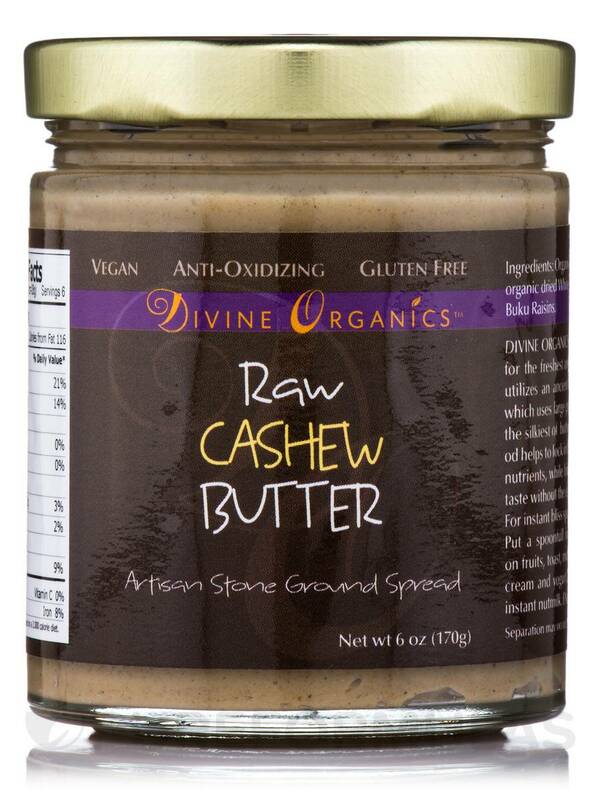 Each glass jar of Divine Organics' Raw Cashew Butter contains six ounces of rich‚ creamy cashew butter. Divine Organics manufactures a wide array of natural food products. They taste great‚ while also helping your body feel good. The ingredients in Divine Organics foods are sourced from sustainable farms to promote overall health. 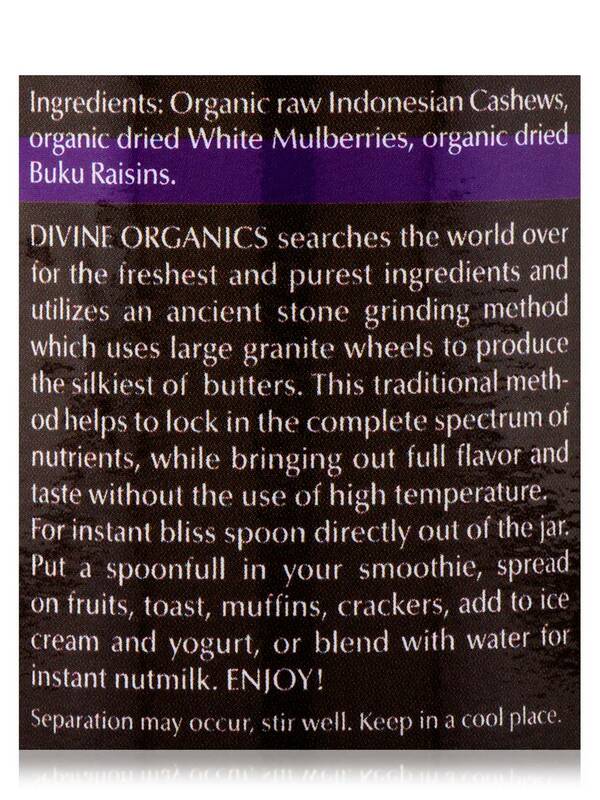 Ingredients: Organic raw Indonesian Cashews‚ organic dried white mulberries‚ organic dried buku raisins. Separation may occur‚ stir well. Keep in a cool place. 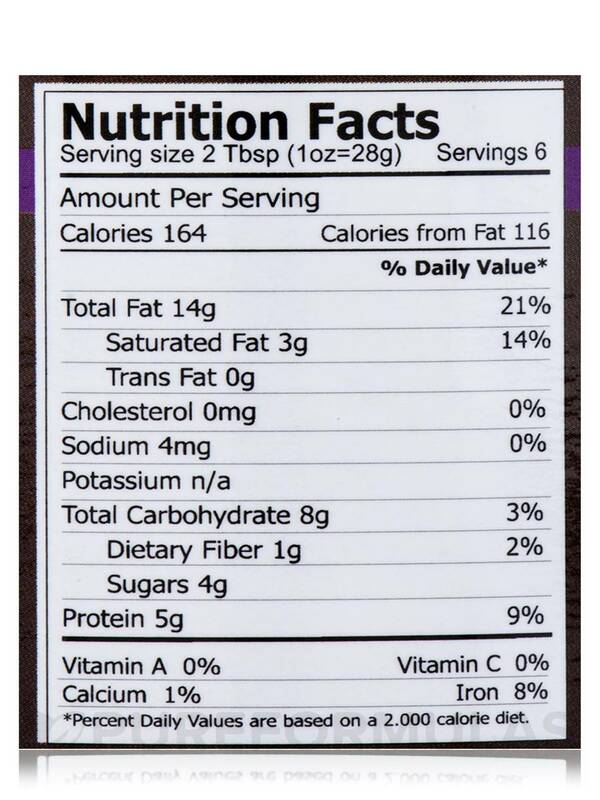 Allergen Caution: Manufactured in a facility that handles tree nuts‚ but does not process dairy‚ grains‚ soy or eggs. Cashew Butter by Divine Organics taste really good and very light and flavorful. Great price. Nice substitute for those allergic to peanuts. Can't taste the cashew too much, but nice flavor nonetheless.